The long-running Castlevania series comes to the Wii as a 3D fighter with Castlevania Judgment. Yes, we've come to terms with series producer Koji Igarashi's solution to shoehorning some Dracula slaying onto Wii controls. But will fans? Pitting thirteen Castlevania mainstays (and one newcomer) from over two decades against each other in a time-bending brawl may not seem like the best fit for series, known for its action adventure bent, but, to some degree, it works. A minor degree? Unfortunately, yes, but rabid fans may find some meat on these bones. See how we weighed in on Castlevania Judgment for the Wii in our review.Loved King of the Castle: Castlevania Judgment's Story mode is dull and lacking in actual story (Spoiler alert: You fight!) but the Castle mode makes up for it. This series of battles through Dracula's dwelling forces you to complete a few dozen fights with varying challenges. Some are simple, tasking the player with smashing a set number of crates, for example. Others throw a few Iron Gladiators at you or give your enemy handicaps — some of which are actually positive. Castle mode gives you the opportunity to score dozens of accessories with which to customize your character as well as unlock music and artwork. It's fun for completionists and Castlevania diehards. Keep It Classic: While the Wii remote and Nunchuk control scheme works better than I'd expected, the option for GameCube and Wii Classic controller is a godsend. After beating Story mode with wrist-wrecking waggling, I went Classic and never went back. The button layout is awkward in its design, requiring double button presses to pull off stock moves, but you'll soon get used to it. It's Better Than Martial Champion: There is a degree of depth to Castlevania Judgment's fighting system, allowing for guard crushes, unblockable moves, quick recoveries, "object actions" and tiered power moves. Pulling some of this stuff off in the heat of battle, particularly with a Wii remote and Nunchuk, often feels like an exercise in futility — it's sometimes better just to try to guard crush with a standard combo. Don't skip the Tutorial mode. Hated Damn These Eyes: Character designer Takeshi Obata, illustrator of the Death Note manga, re-imagines classic and not-so-classic Castlevania to mixed, usually hideous, results. The game is dripping with spiked shoulder pads and garter belts — yes, even on the men — with Simon Belmont and Death bearing the brunt of the garish design. The only saving grace here is that you can slap on bunny ears, bonnets and more to make these awful looking characters even more ridiculous. Is It Really This Imbalanced? : For giggles, I made it through more than six levels of Survival mode in a row with Cornell from Castlevania: Legacy of Darkness by doing nothing but jamming the B button on the Classic controller — I didn't move or block once. Grant Danasty's second level finisher move feels horribly overpowered. These are just a few examples of how some Castlevania Judgment contenders feel out of whack with others. A Miserable Little Pile of Graphics: As bad as the character designs are, the line-up suffers further in their transition to 3D models. The gargantuan breasts on Carmilla and Sypha may make for an amusing visual gag in Maria's story mode, but they look as monstrous and unappealing as Golem. There's plenty of aliasing and flickering, something the game tries to make up for by providing a blurrier option. The game's ten arenas, while detailed, are stale and dreary. Bad Camera: It's not always a problem, but "intelligent" is not how one would describe Castlevania Judgment's camera. It will occasionally give you a worthless worm's eye view of the battle and often obscure one of the characters completely when pulled behind his or her opponent. There are times when you simply can't see your fighter of choice at all. During a long battle with one character, the bouncing camera made me feel motion sick — a rarity. Is There Anybody Out There? : If you really want to play Castlevania Judgment online, make sure to have some friends handy. There are no lobbies, so you'll have no clue how easy it will be to score a random fight. You'll be waiting a while if you want to play a ranked match. The online battles are generally smooth — when they work — but it's just not worth waiting around for. Castlevania Judgment is a decent fighter, one that feels more like fan disservice rather than fan service. While there's plenty to scrape through and unlock for the serious series fan, one willing to overlook the game's flaws for another hit of Castlevania, there's a lot to dislike about what Konami and company have done to some of these classic characters. The mechanics are sound, if shallower than many other fighters, and Wii owners desperate for a new fighting game may find a few hours of fun here — there are plenty of modes to play through and things to collect. For everyone else though, Castlevania Judgment is hard to recommend. 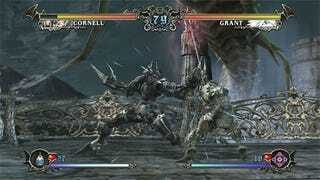 Castlevania Judgment was developed and published by Konami, released in North America on Nov. 18 for the Wii. Retails for $49.99. Unlocked all characters through Story mode, played through Castle mode, Survival and Arcade, tested online multiplayer. Confused by our reviews? Read our review FAQ.